Are you recession ready? Because one is coming...eventually. This is not meant to be a Debbie Downer blog. However, chatter of a looming recession has heated up recently and is one of the most frequently asked questions we hear. This is for good reason since recessions can be complicated, confusing and scary. The increasing angst around a possible recession is not surprising as it’s been 11 years since the last recession. This represents the longest post-World War II expansion if a recession doesn’t occur by this summer. Therefore, it’s never too early to refresh our memories about recessions and understand how markets can behave leading up to and during recessions. It’s inevitable that the U.S. economy will experience a recession. However, no one really knows exactly when the next recession will emerge and how bad it will be. Unless you predicted the duration of the current economic expansion, you should exercise caution when predicting its end. Australia hasn’t had a recession in 28 years. How many would have predicted that?! I can predict however that the next recession will likely make many feel bad. You see, it’s been a long time since the last downturn and the next swoon will probably feel worse than it really is. It’s kind of like when it snows in Atlanta. Since snow is rare in Atlanta, even a modest dusting of flakes can make many Atlantans feel like it’s Snowmageddon. What defines a recession? Recessions happen when economic output drops after a period of growth and are a natural part of every business cycle. Recessions are commonly defined as at least two consecutive quarters of declining GDP. The average length of time between recessions has increased from two years over a century ago to about eight years over the last 50 years. There a many factors behind this including the transition from a manufacturing-led economy to a service economy over the last half century to more effective monetary policy by the Federal Reserve. 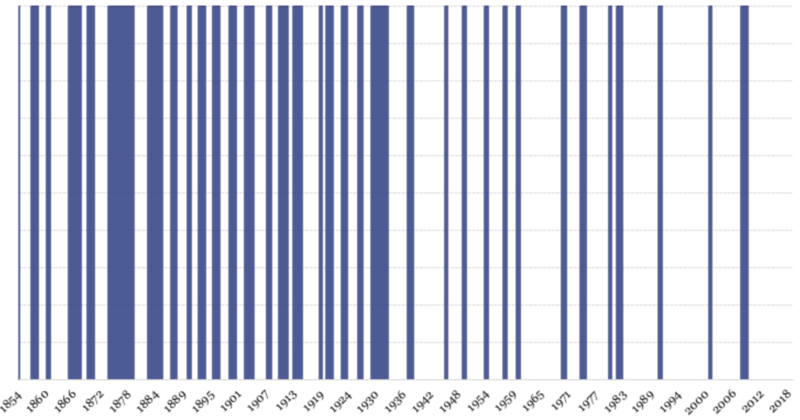 Over the long-term, recessions have been a small part of economic history. However, for those investing in the markets or impacted by employment or business interruption, it can feel endless. 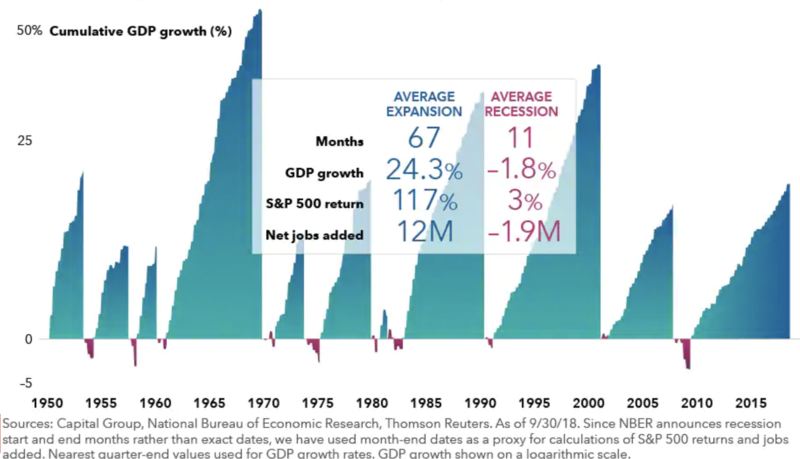 One of the few pieces of good news with recessions is that they usually don’t last very long especially when compared to the more prolonged and powerful economic expansions as the chart below highlights. Over the last 65 years, the U.S. economy has only been in a recession 15% of all months. The chart above also points out is that stock market returns (S&P 500) can actually be positive during the entire recession. A couple of factors are at work here. First, bear markets often begin in advance of recessions. This is because the stock market is one of the best leading indicators that sniffs out that a recession is looming. Secondly, just as the market leads the economy on the way down, it usually leads on the way back up. Typically, the stock market sniffs out (again) the impending economic recovery about six months after the start of a recession on average. Attempting to time the stock market to get ahead of a forecasted recession start and end can backfire in a financially harmful way. Some of the largest stock market returns can happen during the late stages of an economic cycle and right after a market bottom. It’s usually best to stay invested with the appropriate asset allocation to avoid missing out on the enormous market upswings. Just as it’s ill-advised to market time around recessions, it’s also important to be aware of how one’s portfolio is prepared for inevitable stock market stress. As the chart below highlights, over the last eight major stock market drops of more than 15%, certain sectors of the markets have held up well while paying healthy dividends. As shown in the chart above, the consumer staples and utilities sectors have finished ahead of the S&P 500 Index in each of the last eight major market declines. These sectors’ healthy dividend levels, stable consumer demand, cash flows and profitability help buoy returns during a turbulent stock market. Another portfolio tool to help with portfolio stability and capital preservation is the addition of higher quality fixed income where suitable. As always, one’s investment goals, risk tolerance and overall asset allocation are important considerations when assessing where these types of stocks and bonds fit within a portfolio. 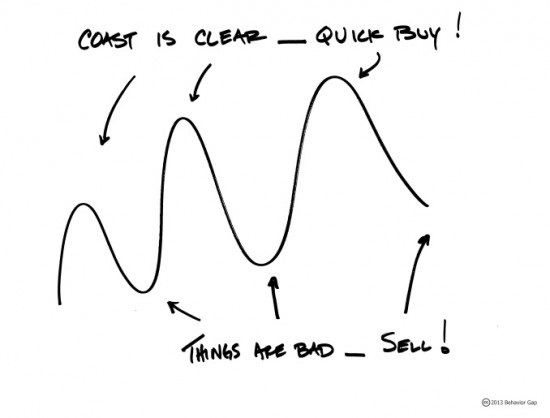 Many market pundits have recently compared the current business cycle to a baseball game with the current cycle being in the later innings. I’ve always believed that it was flawed to compare the business cycle to a baseball game since most baseball games last nine innings with some going into extra innings. Business cycles have no set length with every cycle being different in terms of duration and severity. Although recessions are a certainty, there’s no sure rule of thumb to predict when that day will come. Persistent recession chatter, particularly by the media, can confuse and scare investors especially since it’s been so long since the last recession. However, it’s never too early to mentally and portfolio prepare for the inevitable economic downturn. 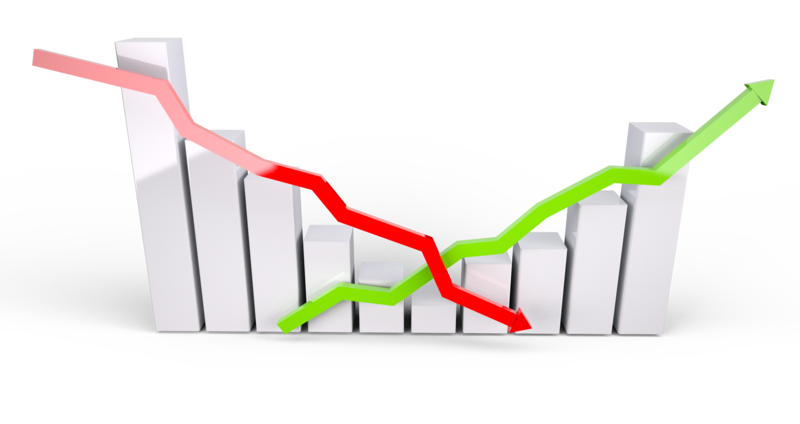 Understanding both the risk and timing of the markets, before and during a recession, can help investors weather the temporary decline and possibly take advantage of opportunities as they arise.